Today I wanted to share with you a great tip on how you can quickly get more traffic from Google and increase the SIZE of your WordPress blog at the same time. I have also developed a handy little tool that will help you with this which you are free to download below! This technique focuses on TAGS and how you use them. So, what is a post tag? A tag is an indexable page that focuses on one keyword. You can then tag specific posts that are relevant to this specific keyword. A user may search for “this” keyword or a similar keyword and find your site in th search engines via this indexed tag page. They will then see any relevant posts which they can then click through to. So, How Can This Benefit You? By adding a decent number of tags to EACH post you publish you are essentially creating HUGE exposure and increasing the size of your website ten-fold. When you publish a post you will naturally rank for a certain number of keywords. However, you can’t cram a huge amount of keyword phrases within your article content without it looking… well unnactural and hard to read. In the video above I selected a number of keywords that were “very” similar. It is best to vary your keywords more than the examples I shown in the video (I just wanted to show you an example of the process). Also, try and find some good longtail keywords that contain 5 – 6 words. These will be much easier to rank for. A variation of these can make a difference. I may have gone a little overkill in my video but adding a number of tags, particularly varied and descriptive will give you more REACH when obtaining more traffic through Googles search results. Just make sure you don’t over optimize by using lots of “near” identical tags. The example in my video were too similar really so try and diversify a little. Up to now I haven’t fully utilized the TAG feature within WordPress for all of my posts although I will be from now on. Below you will see a screenshot showing all the tags for one of my sites that are indexed in Google. All 308 of them! Google takes notice of these and indexes them. 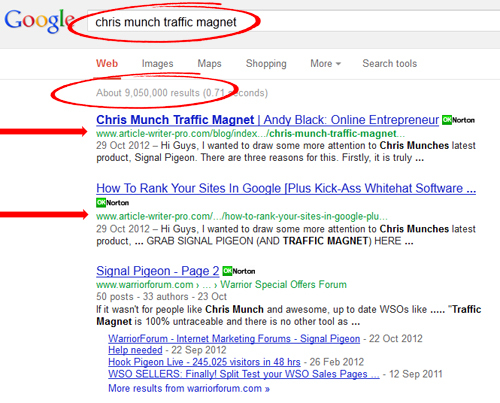 Here is an example of one of my tag pages ranking No.1 in Google for the tagged keyword. You will see that the tag has even outranked my MAIN post that the tag links to. 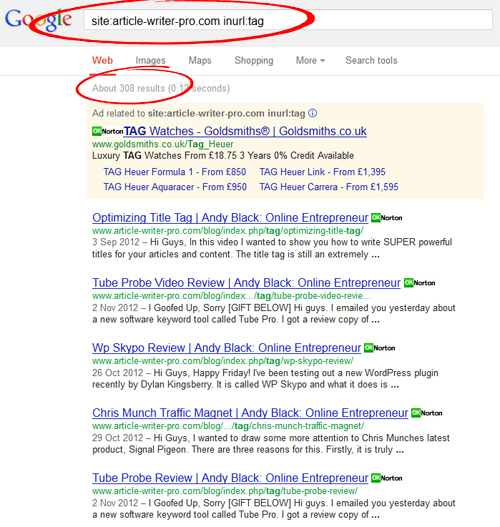 This is the whole point of tags… to gain additional traffic for a large number of keywords. I hope you have learned a lot from this blog post and start putting this technique into action yourself. I mentioned in my last blog post about a super cool link building software application that will be available on Tuesday. I’ll be putting together some cool software bonuses that were designed specifically for this link building software to help you quickly and effortlessly build links to your websites. This really is one to look out for! Great stuff. I was vaguely aware of tags but had no idea how to maximise their use. Fantastic little tool as well – I know from experience of building keyword lists just how much time it will save. I normally leave my son Craig to assess and download software, Andy, (Same website) we work together. However, I could not resist downloading this piece of kit as I often do a bit of work from home and will find this extremely useful. Thanks a million. If you ever get down to this part of the world, Newquay, we would love to make your acquaintance. Just e-mail us and we’ll have the kettle on. Dave. Great software! Keep up the good work! IN both cases things look normal until i try to copy my kws from the clipboard into your sw. Nothing works. No matter what i cannot load anything into the sw? In both cases it just pops up a nav bar for moving back etc. Perhaps a glich somewhere … or maybe I’m the glich, but i really would like this to work. Hi Allen, yes apologies. The version I uploaded has a fault with the “Importing” botton so I will rectify that and upload a new version shortly.